These works were drawn from the contemporary art section in Banco Mercantil’s art collection in Caracas. The concept of the exhibit drew on Jean Luc Godard’s use of the jump cut, a cinematographic term that refers to the editing of film shots causing a disjunctive and visible break in the film’s continuity, camera position, or time. he work of Venezuelan artists in this exhibit highlight dialogues with the past and present, reflecting a break from kinetic art and the idea of modernity as a concept in crisis. 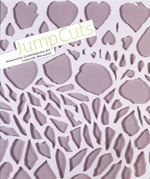 The catalogue includes essays by Gabriela Rangel, Tahía Rivero, Lorena González and Jesús Fuenmayor.